The photograph above was digitized from the original in the University Archives. The original was taken in 1856 by J. E. [James Earle] McClees (1821-87) of Philadelphia; McClees is one of the first photographers to make photographs on paper. 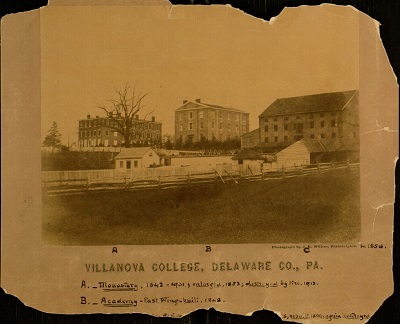 This view shows the Monastery, the Academy (now part of Alumni Hall, one of the oldest buildings on campus) and a large barn which burned in 1898, was rebuilt in 1899 and again destroyed (information on photograph). This view was taken from Lancaster Avenue. To learn more about McClees see this exhibition catalog. The Academy (now Alumni Hall) is barely visible in the center of this 2017 photograph, behind the Augustinian cemetery and St. Rita’s chapel. Original photograph is in University Archives; digital version in the Digital Library. Modern photograph by Alice Bampton, Communication and Marketing Dept.